Satellite signals, mobile phone communications, radio broadcasting. The air around us is full of artificial radio waves. Now, researchers have found a way to tap the energy from these electromagnetic waves to power small wireless devices. And the technology needed to do so can be printed on a piece of paper. "There is a large amount of electromagnetic energy all around us, but nobody has been able to tap into it", says professor Manos Tentzeris of the Georgia Tech, who is leading the research. Tentzeris and his team use an antenna to intercept the radio waves. At the start of the project in 2006 the receiving antenna only covered frequencies of 100 and 200 MHz. Since, the team has developed an ultra-wideband antenna that intercepts signals from frequency ranges between 100 MHz and 15 GHz greatly increasing the power-gathering capability. The captured energy is converted from AC to DC and stored in a battery. The technology yields only a small amount of electricity –about 1 milliwatt- but that’s enough to power certain sensors or microprocessors. The wireless, self-powering mini-systems could have different applications. They can function as radio frequency identification trackers of shipped goods or as monitors of environmental conditions such as heat of humidity. They could also serve as backup systems of remote positioned devices such as solar panels and be programmed to send a distress signal when the main power system fails. Perhaps the most amazing part is that these self-powering sensors can be printed on a piece of paper using a standard inkjet printer. The ink is a somewhat less ordinary as it contains silver nanoparticles. Nevertheless, when the devices are ready to hit the market they will be easy to produce at low cost. 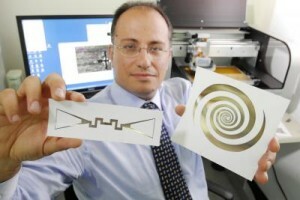 Photo: Prof. Tentzeris shows a print out sensor (left) and ultra-broadband spiral antenna.